When five young men who are a typical modern concoction of traditional Iranian values and MTV play music together what will it sound like? 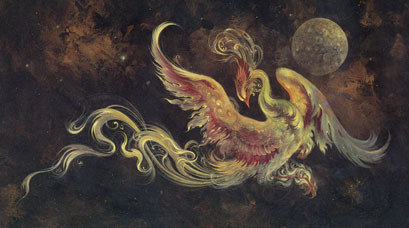 Simorgh is the name of a mystical bird in Sufi folklore. As a band of young urbanites however, their music incorporates group chanting and a lyrical poetry that is folk-rap, accompanied by the evocative ney flute, tar strings and the empty bellow of the daf drum. This alluring mixture is – as far as our experience shows – at it’s optimum best when seen live, so we brought them into the studio to whip up some of that tribal feeling we’ve come to associate their performances with. Fari Bradley talks to the five members of the band about leaving university, playing football, parents, Bryan Adams and musical instruments as weapons of culture. Simorgh run workshops for the BBC on Iranian music and put on their own concerts around London. With their own unique melange of influences, the band stand for something many of us can comprehend: what it’s like to be a cultural cocktail in London now. This programme was originally broadcast from the Resonance104.4fm studios on July 21st 2008. This entry was posted in highlights, Promos, Shows, Six Pillars to Persia and tagged BBC music, BBC Workshop, books, classical music, daf, Entertainment, ethnic, Fari Bradley, folk, fusion music, History, Iran, Iranian, Iranian community, Iranian Culture, literature, live interview, Media, middle east, ney, omid e mehr, Persian, persian culture, Press, publishing, radio, Radio listings, Resonancefm, simorgh, Six Pillars to Persia, sufis, tar on May 28, 2009 by sixpillarstopersia.